Dogs are brilliant and insightful animals. So training them is a champion’s task. Without proper training, dogs will act like beasts. They can make your home dirty. They can crush your most precious things. Annoying Barking, digging, and dog on dog aggression is also possible in dogs that have not had any training. Pooches are one of a kind in connection with us. They have their own particular outstanding needs. For the most part, we expect our dog to act appropriately soon after we bring them home. It is important to realize, though, that training does take time. Some think of their little dogs as human babies and expect them to act in that way. Rather than assume they will behave as little four legged people, we should look at what their needs may be. Our training expectations must be reasonable, and with consistent effort on our part, we can accomplish much with our new dog. Not only will we be happy with the results, but our dog will be adequately trained, and the bond that we have developed through out the training process can only deepen. Dog training opens up a line of communication between people and their dog. Many experts now suggest that the average dog has the intelligence of a two to three year old. They are capable of understanding many more words than we first thought possible. Training increases their “vocabulary,” making it much easier to communicate with them. Standing and bending over your small dog can be scary to him. They need to get to know you, your vocal tones, and begin to develop trust. She may feel overpowered by your height or any awkard movements. The best way to handle this is to squat or kneal down when beginning the training process. A soft voice, some eye contact and slow movements in particular with a very young puppy will build her trust so that she will want to accept training from you. Little puppies need small sized treats – tiny bits of something appetizing. A treat about the size of a pea is all you need. If you use large training treats or biscuits, your small puppy will spend all of her training time chewing up the mouthful of treats. You will lose her attention in a matter of seconds. You can purchase or make treats to break into little pieces. Likewise, you can use these treats as part of her daily diet. 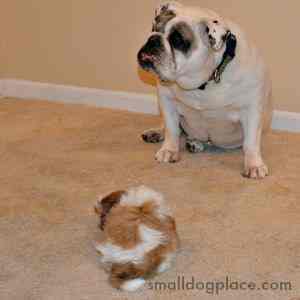 Choose small toys and equipment for your tiny puppy. Your little puppy needs a lightweight collar, harness, and leash. As a rule, leather and chain collars and leashes aren't the best choice for small pets. I generally prescribe using a harness for small canines to prevent any pulling that might cause neck injury. Some little puppies have unfathomably delicate necks., especially those bracheycelphic breeds. 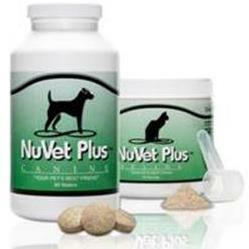 What's more, just as the treats should be small, so shoud your pooch’s toys and other supplies such as water bowls. Get down on your dog's level to assure trust in your new puppy. Training a little dog from a standing position can be brutal on the back, and you don’t need that torment when training your dog. When you're attempting to concentrate on improving your pet's conduct, you should be comfortable. At first, you ought to sit on the floor to spare your back, and seem less scaryto your small puppy. Alternately, if you prefer, you could sit on a small stool or chair, or move the puppy to a raised surface such as a table or bed. If you do the latter, remember to supervise carefully, so your puppy does not accidently wonder off to the side and fall off. Training Tip Number 5: Give a Small Puppy a Bed They Can Call Their Own. Just like small human children, puppies can sometimes be difficult to put to sleep especially if they are having fun. 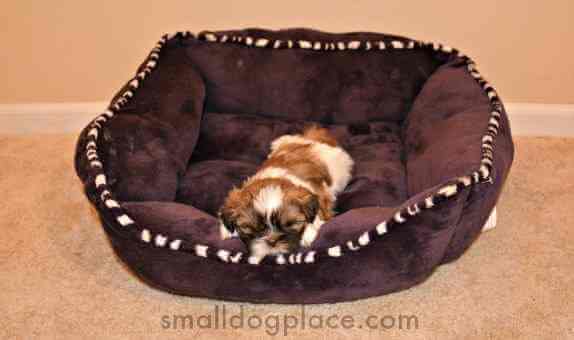 A comfortable bed is a must for a puppy and be a crate or a small soft dog bed that he can call his own. Most puppies will appreciate the comfort and security a dog bed brings. It is not advisable to let a young puppy sleep with you, at least not at first because they are not likely to be house broken. You can also teach your puppy to go to his bed on command just like you teach the dog commands, sit, stay and come. Pick a word such as “Bed,” to use as your command word. Have a few tasty treats on hand. Use the treats to coax the puppy into the crate or bed and then as he does so, say the word, “bed” enthusiastically and give him the treat. Repeat as necessary until he will go to his bed at your request. As people, we often do not think twice about going to our puppy and picking him up into our arms. But, what does that feel like to a tiny puppy? Little dogs are regularly startled when they are abruptly lifted off the ground by a human. Your pup’s feet are on the ground one minute, and in the next, the ground underneath has disappeared. You can imagine that if this happened to you, it would likely be an upsetting occasion. For this reason, you should prepare your puppy with a verbal prompt that signals you are about to lift her up. Simply make it a straightforward single word flag such as the words, "Lift" or "Up." To prepare your pet for the sign, put your hands on her, say the word, and apply a tad of weight without actually lifting her. This gives her an opportunity to comprehend she's going to be picked up. When you know, she's mindful you're going to lift her up, simply do as such. Predictable use of the prompt will help her figure out how to get ready for "lift off." 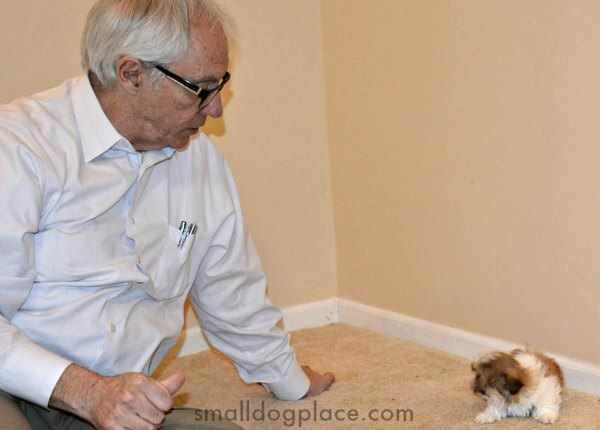 When trying to socialize small puppies to larger dogs, give them some space. With time and a little space, a small dog will warm up to a much larger dog. 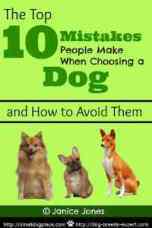 Your puppy ought to be permitted to meet new individuals and other dogs or animals, on her own terms. Forcing a bashful or frightened little canine to meet a new acquaintance prevents her from getting away if she needs to. So leave her on the ground, and watch what she does. On the off chance that she appears to be nervous or hostile, don't push the issue. If this does happen, you many need some additional time and added work on your part to socialize your pet. On the off chance that you wouldn't permit a 70 pound big dog to hop up on you, don't allow the same conduct from your little one. Little mutts can figure out how to sit and remain just like their larger canine cousins. The same goes for hopping up into your lap, charging out the entryway in front of you, or tearing treats from your fingers. Try not to acknowledge discourteous conduct because your pet is little. 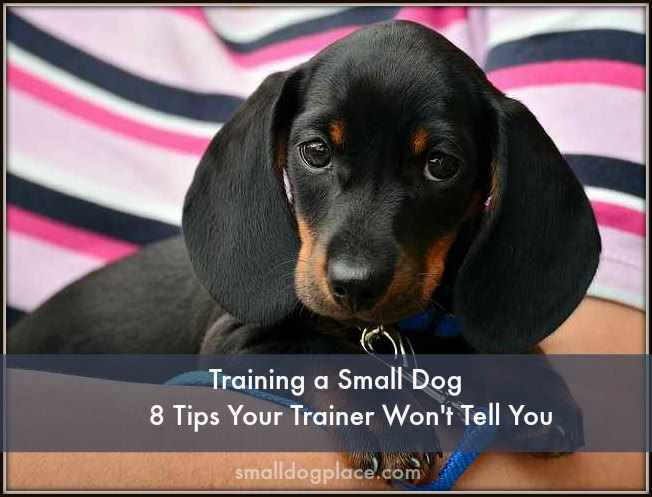 Nowadays, training a small dog is fun for both your dogs and you. On the off chance that you can spare a couple of minutes every day to be with your dog, you can train it yourself yourself, using these tips and other resources found on the web. 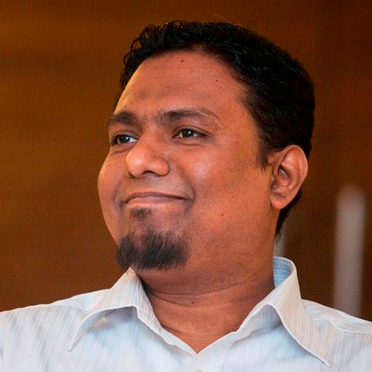 Hi, I am Rubaiyat, I write on topics related to pets especially dogs. I try to put my best effort to provide the most useful and trusted information for my reader. Currently, I am writing about how to choose best dog trainers at their locality and unbiased quality reviews for dog crates, furniture, and gears within the budget. You can have a look at my site http://dogmakers.com for more information.